Fr Roger Nesbitt, Fr Peter Geldard and myself were talking today with David Kerr about Anglicanorum Coetibus in a programme that is to be broadcast by EWTN. Archbishop Nichols has recently announced that three former Bishops of the Church of England are to be ordained to the priesthood at Westminster Cathedral this coming Saturday. The new General Secretary of the Bishops' Conference, Fr Marcus Stock, has produced a good document giving background information on the establishment of the Ordinariate. It is also well worth reading the piece by Anna Arco of the Catholic Herald: Church reveals fine details of ordinariate. It is wonderful news that the Ordinariate is to be formally set up in the near future. It is an example of Pope Benedict's intelligent approach to difficult problems that he has made this arrangement which will, I am sure, smooth the path for many Anglicans to be received into Communion with the Church. Although it is true that in the anglo-Catholic wing of the Church of England, many parishes use the Roman Missal, it is rather exciting to think that some elements of the Anglican patrimony may become part of the Liturgy of the Catholic Church. Some of those elements (for example many of the prayers of the Book of Common Prayer) are part of our general Catholic English heritage which was disrupted by the Reformation. To think of there being even a modest transfer of some of the great choral tradition of the Church of England shows that there is much room for what Pope Benedict has called in another context "mutual enrichment." 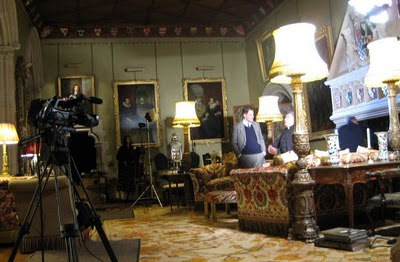 The setting for today's filming was Arundel Castle, the home of the Duke of Norfolk. The Castle is open to visitors from April to October but can be hired for filming at other times so I had a fascinating walk down various corridors, and up staircases to get to the room that was used. It made me keen to return for a touristic visit another time.